Ben Nichols writes about the final piece of wisdom the judges gives out, naming it about the name of the book. The judge giving out the widom shows that even when demented and insane, new things learned can shead light on different things you never thought about. 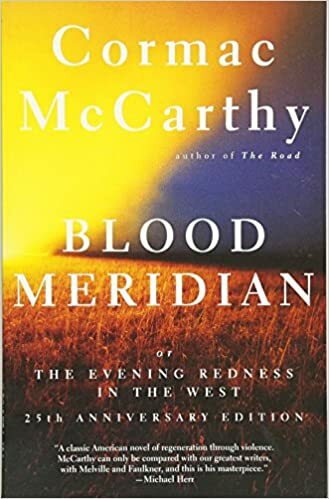 Leaving the book with a piece of wisdom from the antagonist, shows that the blood meridian means something and that its always there over looking everyone. This song is the following of the main character of the book. The song tells the story of the main character’s beginning of his life and following him. The song gives the brief view over the kid’s life, following him at he moved out west when he was 14. The song goes with the story, showing that the world is harsh and whatever you do to help someone will always come back and punish you for what you did. Davey Brown was a song about the character in the book named David brown. David brown was a character that stood out by always making his way out of situations. David brown seeks help from other people from time to time. When people seek David brown to help them out, he either doesn’t help them at all or get something out of it for himself . The song Davey Brown is meant to be lighthearted to reflect on the character’s foolish, disrespectful behavior towards others around him. This song follows the character Grannyrat Chambers, who served in the Mexico-American war in The Missouri Volunteers. Chambers joined Glanton’s gang only to disappear from the gang very soon after. Chambers met the kid in prison in a city called Chihuahua City. The song tells how Chambers went into prison and the gang, and what he experienced in his path through life. Tobin was an priest before going into the Mexico-American War. Tobin was a member of Glanton’s gang, a gang of people who would scalp people. Tobin and The Judge would fight over being a spiritual influence to the kid, and would succeed in the end, allying with the kid against the judge. Toadvine was first seen in a town in Texas, when he almost killed the kid after an argument between the two of them. They join forces and burn town a hotel together and split ways, later coming back together in a prison in Chuhuahua City. Toadvine ends up in the end dying by being hung with David Brown in Los Angeles. The judge was the antagonist of the book, following the kid through his journey around the west. The song displayed no lyrics but follows an unclear path through the madness in the judges mind, with distortion added onto the notes. This song describes the setting of the book, where the kid travels along finding new acquaintances helping him along his journey learning about how harsh life is. 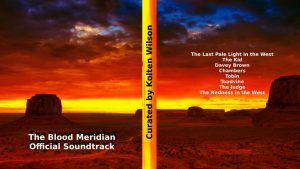 The song was originally called blood meridian but was reworked into the new version.